Luke Rockhold (@LukeRockhold) has informed me he and the UFC have come to terms for the Chris Weidman (@chrisweidman) fight on 11/3 in NYC. Fight was basically agreed to, but Rockhold needed to speak to UFC about his deal. That's done, and he anticipates signing shortly. The last time Luke Rockhold competed in the Octagon, he suffered a devastating knockout defeat to Yoel Romero at UFC 221. Had Rockhold won, he would have become the interim middleweight champion and earned a title shot against Robert Whittaker. Now that Robert Whittaker has defeated Yoel Romero and his next opponent, Kelvin Gastelum, has already been confirmed, the winner of this fight may very well be the next person in line for a title shot. On paper, there is a lot of pressure in this fight for Chris Weidman. With a loss, he moves to 1-4 in his last five fights, with two losses to the same opponent, a statistic that could become particularly burdensome if Rockhold were to reclaim the middleweight championship. 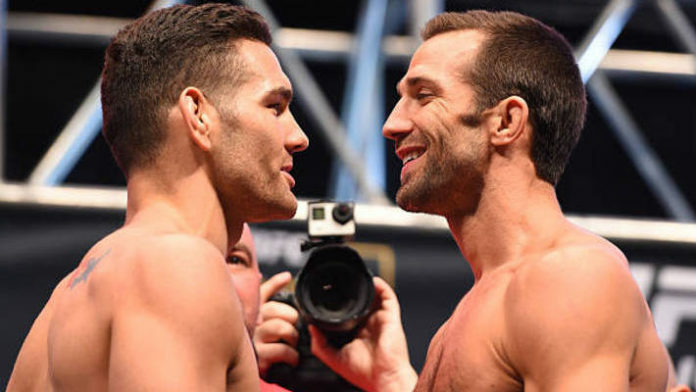 The rematch between these two was originally set for UFC 199, which would have granted Weidman an opportunity to regain the middleweight championship. Unfortunately, Weidman had to pull out, allowing Michael Bisping to jump in on two weeks’ notice and knock out Luke Rockhold for the title. Who do you think wins the rematch? Luke Rockhold or Chris Weidman?